A range of versatile lightweight aluminium material lifts, extending to a variety of heights up to 25ft. 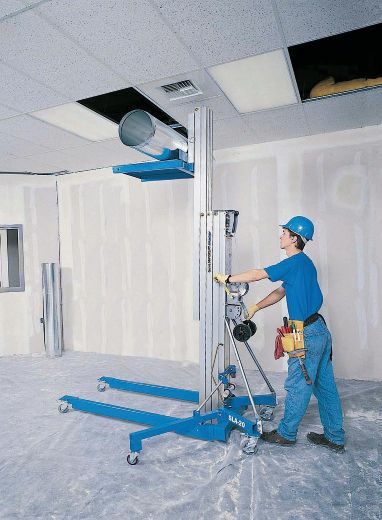 These compact material lifts have multiple uses in the construction, entertainment, engineering and maintenance sectors. Speedy hold the UK’s largest fleet of Genie material lifts available for hire, plus a wide range of accessory options. The unit sets up quickly without any tools and is ready to go to work in seconds. The rear transport wheel also allows manoeuvrability on uneven surfaces. Legs fold up and attachments are removable for easy storage and loading.